This bread is to. die. for. If you've never baked with fresh strawberries before, you are totally missing out! When mixed into a bread or cake, they turn into soft little pockets of sweet and tangy strawberry jam. 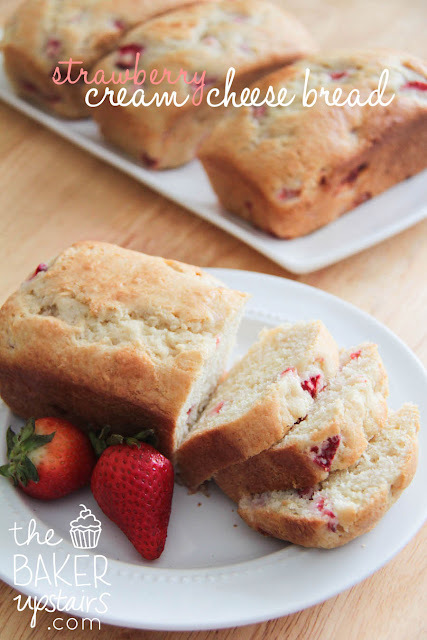 I've already shared my favorite strawberry summer cake recipe, which I make all the time, but this bread is a tough competitor for my favorite fresh strawberry recipe. It's super simple and easy to make, it tastes amazing, and the texture is perfectly moist while still feeling light. I followed the recipe pretty closely, except that I added closer to two cups of chopped strawberries. I also baked it in four mini loaf pans instead of a full size loaf pan. I shared some with my neighbor yesterday, and she dubbed it life changing! Make it today, so it can change your life too! Grease and flour a 9x5 inch loaf pan. Using an electric mixer, cream the butter, sugar and cream cheese until fluffy. Add eggs one at a time. Mix in vanilla. In separate bowl, mix flour, baking powder, baking soda and salt. Blend flour mixture with butter mixture just until blended. Add buttermilk and stir until just combined; do not over mix. Carefully fold in strawberries. Dough mixture will be thick. Bake in a 350°F oven for 50 to 60 minutes. Can you use this in a bread machine? I can't say for sure, because I don't own a bread machine and haven't ever used one, but my instinct would be no. Because it's a quick bread, and doesn't have any yeast, it doesn't really need a rise time. Also, I would be afraid that the bread machine would over-mix it and crush all the strawberries. It's super quick to mix together anyway, so I would suggest doing it outside the bread machine. If you do try it, though, let me know how it works! This bread sounds absolutely delicious!!! How would frozen strawberries do? Looks and sounds delicious! Thanks for sharing!! Just popped this out of the oven. I used vanilla sugar, 2 cups of strawberries and 6 oz cream cheese and baked 2 8x4 loaves. Ah-mazing! to convert to mini loaves, did you decrease oven temp and/or cooking time?? To use mini loaves is the temp and time different????? This was OK. It needed more flavour though, maybe a hint of cinnamon? Also, I felt the baking soda/powder ratio was off as the loaves and muffins didn't quite raise as well as they should have. I doubled this, made two loaves and a dozen muffins. They were good but definitely lacking some flavour. Will try again with some modifications.